Should you keep receipts from your bank or cashpoint machine? Sometimes people say you should keep cashpoint (or ATM) receipts, and check them with the actual statement from the bank. Withdrawing money from a cashpoint is an automated procedure that always transfers the correct amount from two accounts. Or, at least, it should! It's a good idea to keep the cashpoint receipts. The hardware and software of the cash machine have to talk to the bank computers via data connections, and sometimes errors can occur, as with any software. 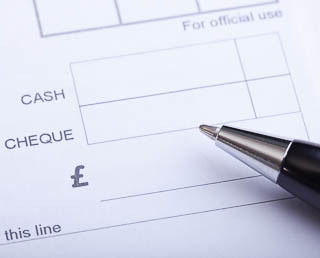 Errors would normally get caught between bank cashpoint software and the main bank computer, errors can happen, and the bank would need additional evidence in the form of a printed receipt to be able to rectify the problem. "I've found it's just simpler to keep all of my receipts rather than debate which receipts to keep and which to throw away. I shove all my receipts from August in an envelope labeled August. Then, next year (12 months later) I shred the envelope. That way, if I see a bank error, need to find a receipt to do a return or warranty work, etc. I have all of them available for a year. Doing 1 envelope per month means I only have 12 envelopes at any time and I can shred an entire envelope without bothering to sort through receipts inside the envelope." That's being very organised, and could save a lot of money if anything goes wrong with a transaction.